The theme for our upcoming Clergy-Laity Congress, "The Orthodox Christian Family: A Dwelling of Christ and a Witness of His Gospel," directs our attention to the true identity of the family as created by God and to the nature of family life when connected to Him. For the Orthodox Christian family, being connected to God in this way means that the family is the dwelling of Christ. First, in this Paschal Season we must affirm that in the Risen Lord and the power of His Resurrection we find true life. This is life that is free from corruption and death. It is an abundant life that overcomes sin and evil. It is life that is filled with the grace of God and seeks His will. When the family is connected to God, Christ is welcomed and recognized in its midst. Family members live and share in the life that is given to them by Him. His holiness and power is known. His love is felt and shared. Second, the Orthodox Christian family is the dwelling of Christ through the power and presence of the Holy Spirit. In preparing His disciples for the time when He would no longer be physically present with them, Christ said, "But the Helper, the Holy Spirit, whom the Father will send in My name, He will teach you all things, and bring to remembrance all things that I said to you" (John 14:26). The Holy Spirit dwells with and within the family connected to God, producing the spiritual fruit of love, joy, peace, longsuffering, kindness, goodness, faithfulness, gentleness, and self-control (Galatians 5:22-23). These are the attributes that are essential in maintaining strong bonds of love and faith within the home and the lives of each member of the family. Finally, as a dwelling of Christ filled with the presence and fruit of the Holy Spirit, the home becomes a sacred place, a holy environment, a Church in the home - kat'oikon ekklesia (Romans 16:5; I Corinthians 16:20). The home becomes a place of worship, as each member, both individually and together, offer praise and thanksgiving to God. It is a place of prayer, as the family seeks the guidance, wisdom, and forgiveness of God in the challenges of family life. It is a place of teaching and nurture, where our Orthodox Christian faith is discussed and lived by example. The home and family that is a dwelling of Christ is also a place of service. Each member of the family seeks to serve the needs of the other members, and together, the family offers diakonia to friends, neighbors, and to any in need as they are led by the Spirit. To become and remain a dwelling of Christ, the family needs the support of the local parish. Certainly, it is essential that the family participate in the life of the parish; but it is also critical that the work of the parish proceeds with a clear awareness of the spiritual needs and challenges of families. Our priorities and work must be directed toward increasing our support and resources for the family, so that through faith and the presence of Christ, families become and remain strong and vibrant Orthodox Christian families. As we prepare for our Clergy-Laity Congress, I ask that you continue in your prayers and consideration of our theme. Reflect on the challenges and needs of your family and families today. Affirm our mission to help families become strong Orthodox Christian families with lives and homes that are the dwelling of Christ. Prepare to participate in our Congress, offering ideas and support as we strengthen our ministries and increase our effort with the blessings and grace of our Risen Lord. His Eminence Archbishop Demetrios of America addresses the attendees of the Grand Banquet of the 2014 Clergy-Laity Congress on July 9, 2014. His Eminence Metropolitan Evangelos of New Jersey addresses the attendees of the Grand Banquet of the 2014 Clergy-Laity Congress on July 9, 2014. His Eminence Metropolitan Stefanos of Kallioupolis and Madytos, the Patriarchal Representative to the 2014 Clergy Laity Congress, addresses the attendees of the Grand Banquet of the 2014 Clergy-Laity Congress on July 9, 2014. His All-Holiness Ecumenical Patriarch Bartholomew addresses the delegates at the 42nd Biennial Clergy-Laity Congress via a live video feed. 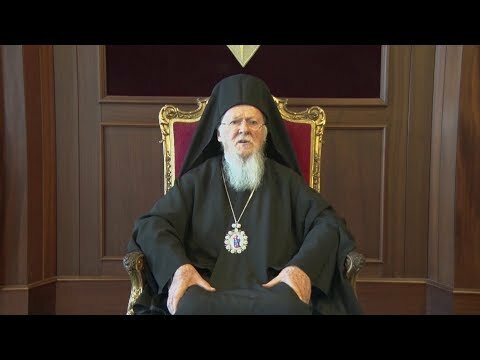 Homily given by Archbishop Demetrios of America during the Hierarchical Divine Liturgy for the 42nd Biennial Clergy-Laity Congress. The service was held in the historic Greek Orthodox Cathedral of Saint George of Philadelphia with hundreds of faithful in attendance.